Indie Retro News: Time Gal - LaserDisc Anime gets a special Amiga release by ReImagine Games! Time Gal - LaserDisc Anime gets a special Amiga release by ReImagine Games! It's a Friday and it's time to get ready for the weekend, but if going out and getting drunk isn't your thing, how about playing the latest Amiga release from our good friends ReImagine Games 'Time Gal'. Now if you've followed our news throughout last year you would've read that LaserDisc support was added to the Amiga emulator WinUAE, as generally LaserDisc games were played via an Arcade cabinet using Amiga 500 hardware, along with a genlock and a laserdisc player. And so it's with great pleasure to announce Taito's 1985 LaserDisc game Time Gal, which has been ported over to the Amiga CD32 and Amiga HDD with upcoming cover by Steve. 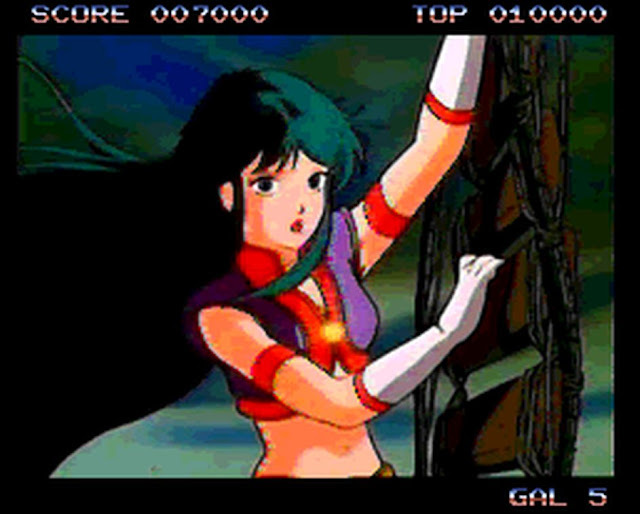 Although Time Gal did appear on the Sega CD, this version is the second release from ReImagine games series of ports and hacks, and has never been seen before on an Amiga. It has been ported from an arcade machine as a 1:1, with all Sixteen levels from the original game, along with "mirrored" versions of each level and all of the death animations (including those that were censored on the Mega CD port!). Furthermore there are six difficulty levels from easy to insane, as well as a special Anime mode for a more relaxed experience! In terms of what is required to play this interactive Anime, you'll need at least Kickstart 2.0, 1MB Chipram (2MB recommended), a 68020 processor, 500MB+ Hard disk space or a 2X CD-Rom drive.